This is the first map that really does give everyone almost equal space. 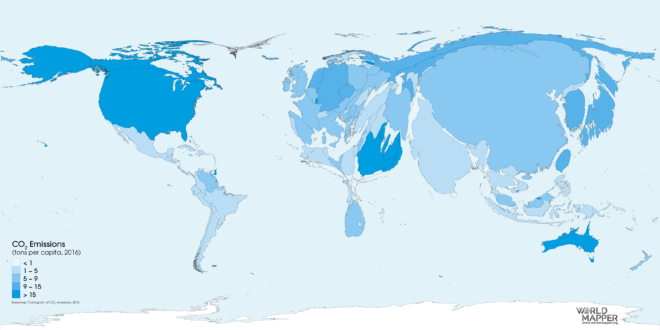 Previous cartograms which claimed that actually gave water too much space. Take almost all the water out and we see a new world. 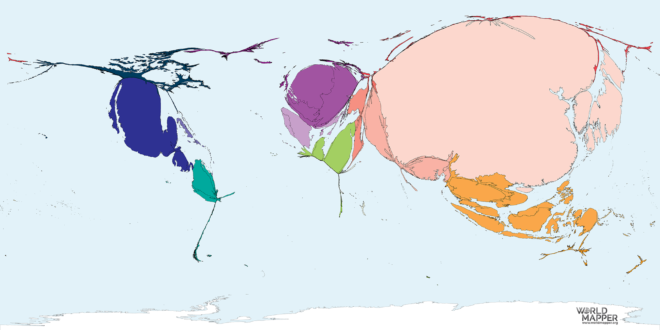 The cartogram shown in this graphic presents an experimental approach to the creation of a gridded world population cartogram. 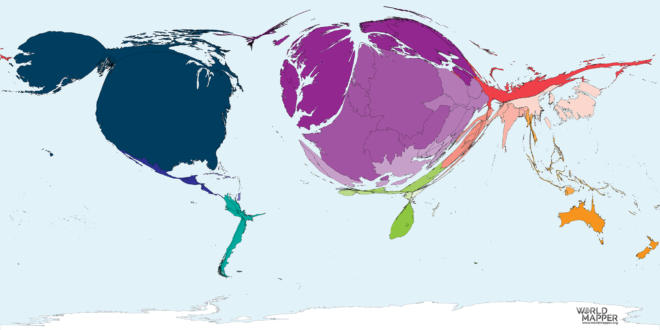 Cartograms have become a more commonly used alternative to conventional maps. Recent advances by computer scientists allow for more sophisticated analytical purposes (Tobler, 2004). These include the diffusion-based method for producing density-equalising maps by Gastner and Newman (2004). It is used here as the underlying basis for the development of gridded cartograms in which the cartogram transformation is based on an equally distributed grid (Hennig, 2013; Hennig et al, 2010). The projection shown here is based on the transformation executed over the full extent the earth’s surface (including the oceans) using a 0.25° resolution grid. The resulting equal population cartogram has then been visualised showing the grid only over the land area. In addition, the outlines of the countries are shown. The graphic is available in colour online. The world’s and each region’s largest places (cities and countries) are labelled to enhance readability. The Prime Meridian and the Equator are also included as extremely distorted lines in the left and lower part of the map. This almost egg-shaped representation shows the continents cramped together. 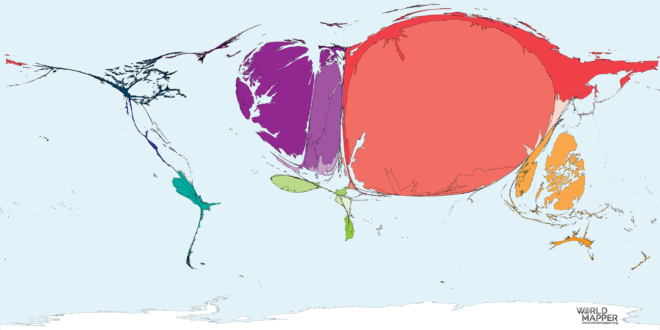 Small parts of the sea areas are visible in this depiction as the white patches between the main continents, despite their population values being zero. 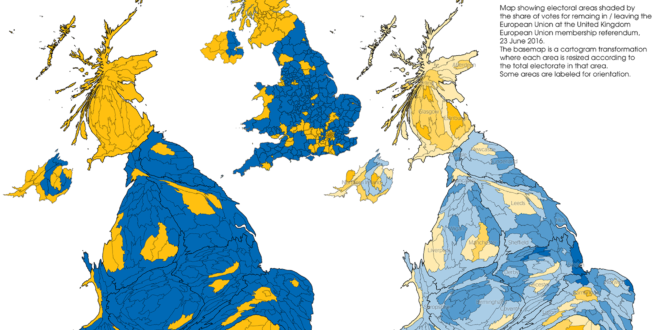 This can be explained partly as a result of the density-equalising algorithm used to transform the maps. Most empty sea area is found at those locations where densely populated coastal areas are next to unpopulated sea area which, as an effect of the diffusion between highest and lowest densities, creates a uniform transition and equalises the differences between these two extremes. 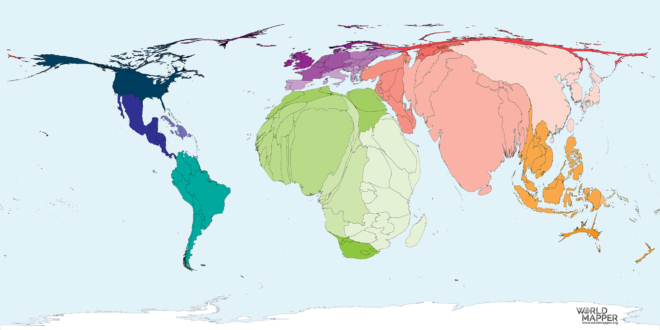 Despite being an unusual form of a gridded cartogram, the analytical capabilities of the display provide insights into the human geography of the world’s population. The four traditional physical hemispheres, dividing the world into north, south, east, and west, become almost irrelevant and are replaced here by a new division. The population centre of the world is situated on top of a mountain next to the Tiger Lake (Badai Talai) near the city of Udaipur. That point, displayed in the map’s centre, stands symbolic for the effects of recent demographic changes in the world population. 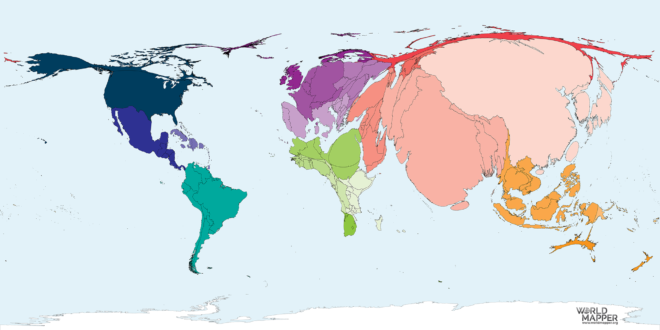 The global population centre is gradually shifting from the currently most populated region in Asia towards a most rapidly growing African continent, which pushes the significance of Europe and the Americas literally towards the edges of the planet in this modern version of a mappa mundi. Also labelled in the map are the cities of Chengdu and Chongqing in the (still) most populated country, China. The region surrounding them, situated in the west of the densely populated Eastern provinces (the Himalayan region in contrast is almost nonexistent in this map), is one of the fastest-growing megaurban regions on the planet, the real dimensions of which become graphically apparent only in visualisations such as this one. 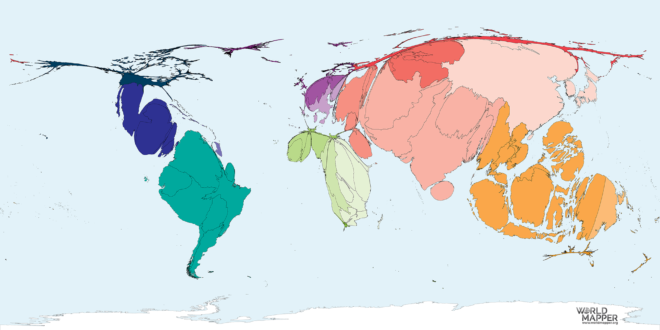 More detailed interpretations of gridded cartograms can be gained by increasing the resolution of the underlying grid that is used in the transformation, as well as by changing the scale and areal extent at which the cartogram is generated [see the World Population Atlas map series for further examples]. Hennig, B.D. (2013) The human planet. Environment and Planning A 45 (3): 489-491. Note: All work on Worldmapper is licensed under a Creative Commons Attribution – Non Commercial – ShareAlike 4.0 International License. 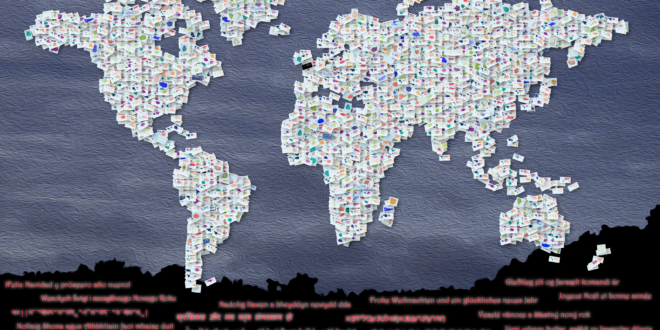 For any commercial use (including in publishing) a map use license needs to be obtained. Contact us for further details.